How do you seal a carton? What is the best tape to close the box with? Looking for a better way to seal a box? Gummed tape offers the most secure way of sealing a box. Gum tape cannot be removed with heat or popping the flaps. Gum tape creates a natural bond with the carton fibers and even absorbs carton dust. To vermin proof, you can also H seal the carton. If someone does try to open the carton it will be impossible to open without leaving evidence. 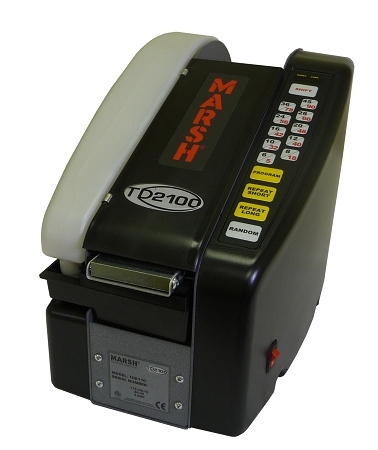 Marsh offers the lowest cost, American made, single brush moistening, guillotine style cutting blades and tank type heater tape dispenser for Kraft plain and reinforced water activated gummed tape for sealing cartons and boxes. TDE110 Standard offers: 6", 8", 10", 12", 16", 20", 24", 28", 36", and 45" plus by pressing the "shift" key the additional lengths of 5", 18", 32", 40", 42", 48", 56", 66", 78", and 90". There are two repeat keys labeled "Repeat Short" and Repeat Long", and a "Random" key. The LCD will confirm your repeat key selections. All new "Apex" design guillotine style cutter. Made of 420HC Stainless Steel. 70oz Water Bottle increases production "Up Time" with fewer refills. Largest bottle in the industry with a rubber valve that reduces water spillage. Tactile keypad with LCD display of programmed lengths for short and long repeat. NEW wide track feeding! The 1.5" feed roll and pinch roll uses a high coefficient friction urethane to ensure accurate and quiet tape feeding. Built-in all metal adjustable tape channel guides. All metal construction, easy to adjust with built-in thumbscrew feature for centering the roll of tape. 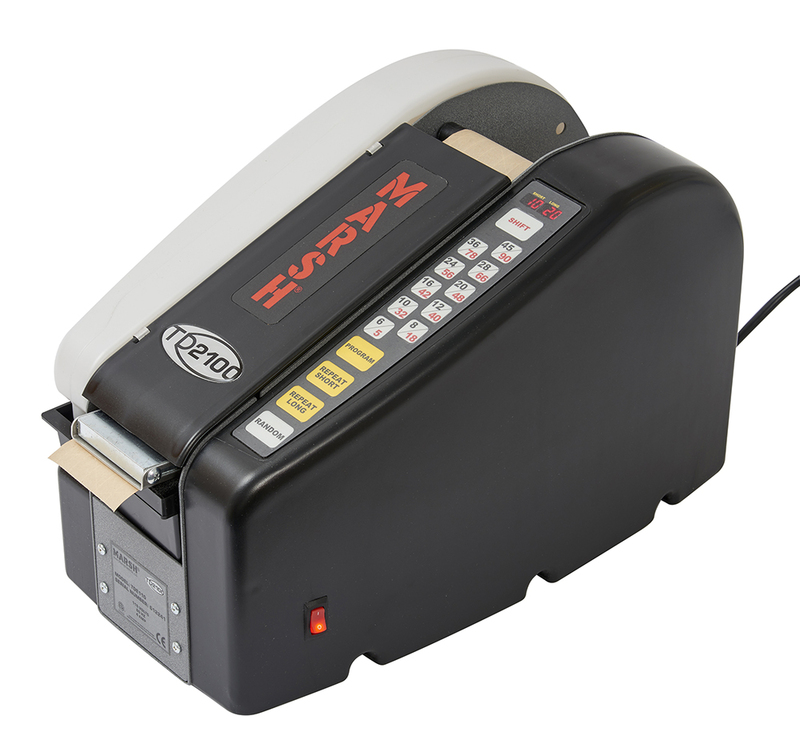 "Open Basket" design offers a quick view of remaining tape roll and easy drop-in reloading. Accommodates up to 1000' (305 meter) tape roll max diameter is 9" (222.6mm). Handles 1 1/2" up to 3" width tape. Certified to CE and to UL 60950-1-03; CSA C22.2. Tape Lengths: 4" to 99" depending upon model. Click here for the owners/operator parts manual. Click here for the detailed technical repair manual. Click here for the parts list. Blade maintenance is required when using the heavier tapes and in some instances can interfere with productivity. On the newer 2100 style machines you will need to remove the blade guard to clean and oil the blade. On the older machines the scissor blades are held in place with only two screws, it will take approximately five minutes to remove and clean. At Pro Pack we do not recommend spray type cleaners or spray oils on this machine due to the possibility of over spray on the moistening brush. The blades are cleaned with a solvent type fluid (lighter fluid works great) and coated with a thin film of oil that will prevent build up of gummed materials. With single brush moistening it is also very important to keep the brush clean weekly with soap and water. Use of dish wash detergent works best as hand soaps can contain hand softeners which will interfere with the moistening characteristics.